stalk, harass, injure, financially ruin, and mentally crumple human prey until incapacitation occurs. What sets this crime apart is that innocents are picked off the street. There is no getting away from the stalkers and no getting away from the unusual technology that is used to take over someone’s life. “For the first couple of months,” says June, “I thought it was a sick game. Now that I’ve been tormented for years, well, it’s clear that organized stalking is a sophisticated crime that follows a step-by-step process to leave the victim as bare and isolated as the dead tree on the cover. He or she may still be standing, but that’s about it. “I’ll sum it up this way. Veiled intimidation ensures that targeted individuals are viewed by the public as free people, which they are not. They are playthings to their controllers. Hostages in plain sight. Victims are quite literally owned yet have limited chance of rescue because their desperate circumstances are misunderstood. Organized stalking is worldwide and is called gang stalking in some areas. 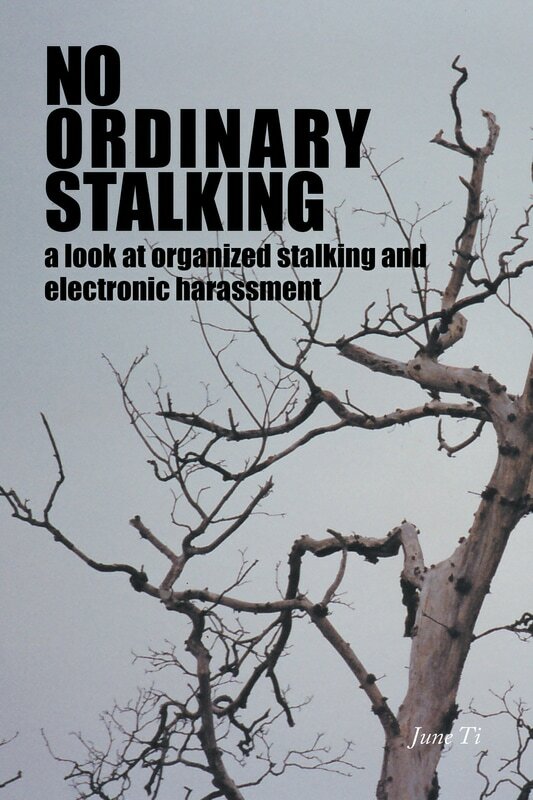 The electronic harassment that accompanies organized stalking is also known as covert harassment. June Ti is a mental health counsellor who was chosen for organized stalking and electronic harassment in 1998. She assists targeted individuals from her home in British Columbia, Canada. or visit her website below.